When we wrote a post the TEC infrared grill a few years ago, we got a lot of suggestions from readers about other grills we should check out (Green Egg, Weber Performer, etc). We looked at many of them and the one suggestion which stood out was the Element Grill from Fuego. A bit of research by the interns revealed that Fuego was created in 2007 in partnership with Robert Brunner – the former industrial design chief at Apple. No wonder the look of the unit was so clean and “Apple-esque”. In addition, we thought it was nicely sized for the smaller backyards of many of our urban RainyDayKitchen readers. While the grill looked fantastic, it was very pricey ($449-$649). Also, reports of some build quality and performance issues dampened some of the earlier enthusiasm for the grill. In 2013, the intellectual property, designs, and patents of Fuego North America LLC were purchased by a group of investors to form Fuego Living LLC. While they completely re-engineered the Element Grill, they preserved the best of the original award-winning design. The re-engineered grill is now manufactured from two new facilities and is offered at a much more affordable price of $299 for the carbon steel and $399 for the stainless steel. When the interns heard about the “re-invented” Element, they made a persuasive argument for getting one for this year’s FirstGrill event. Whenever a big box shows up, we always ask the UPS guys if they would be kind enough to bring it all the way into the office instead of leaving it out in the entry way. 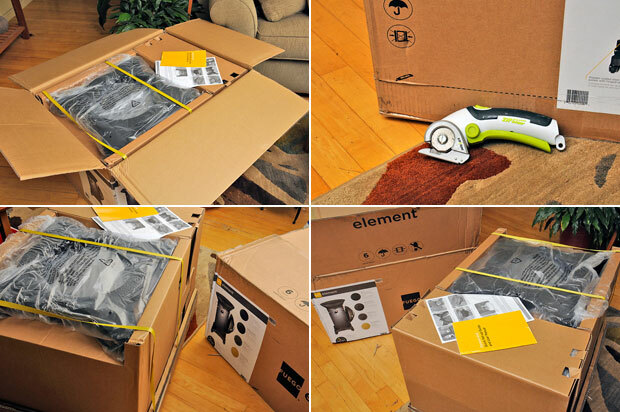 We were glad they did as the box containing the Fuego Element Grill was 80 pounds. While the interns were as excited as anyone that we will be testing a new grill at this year’s FirstGrill event, they were happy they didn’t have to bring it into the office. 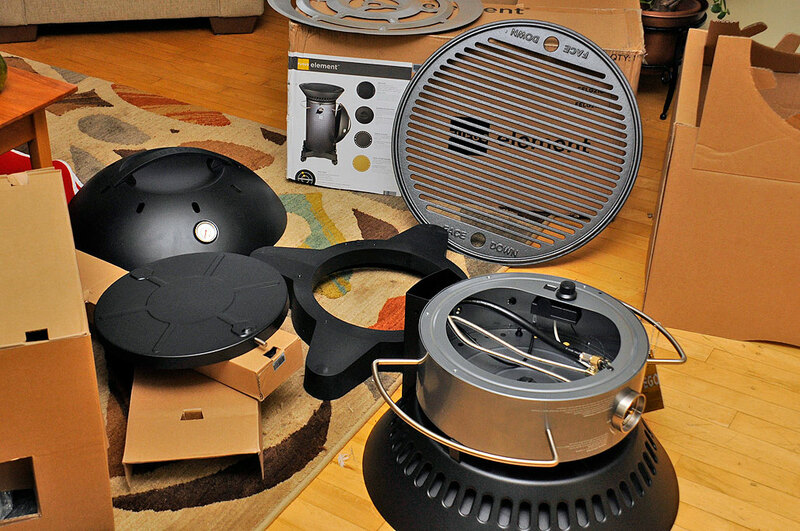 The Fuego Element Grill, like all grills, comes partially assembled. We first had to get the pieces out of the box, then we did an inventory to make sure everything was there. The pieces were well secured inside the box. We were going to lift them out one at a time, but it appeared that the box was designed to be cut apart for easy removal. 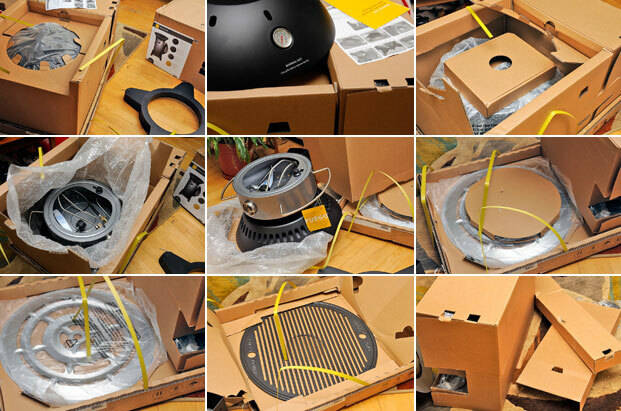 We hope there aren’t any problems with the grill, because with the box cut up into pieces there is no way we would be able to send it back if there were any! Fortunately all the parts were accounted for, and everything appears to have arrived in perfect condition. Heavy stainless steel knob and handles…solid feel, not flimsy. 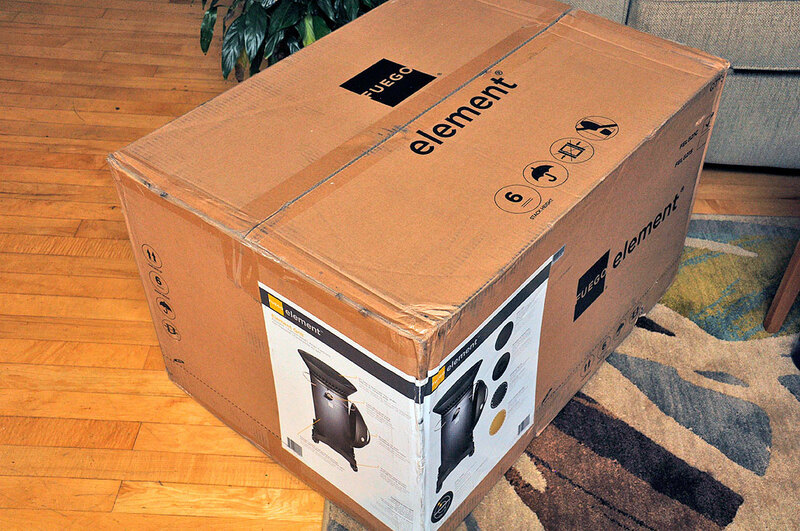 We will have the write-up of the assembly and a FirstLook of the Fuego Element Grill early next week. In the forecast is a nice stretch of above 40º days. Once the snow has melted, we’ll get this grill outside, fire it up, and can get some time with it before the FirstGrill event. Readers can be sure we’ll share our FirstUse impressions as soon as they are available. Five full racks of ribs, flavored ten different ways!! !